A beginner’s clinic is a great way to check out curling and see how much fun it is. We are hosting one on Thursday Sept 24th, 2015 at 7:00pm. The cost is $25.00 per person and usually lasts for 2 hours. Email Melinda at melinda@marpolecurling.ca to register. Space is limited. Dress in warm and comfortable layers and bring clean soled running shoes. Everyone is welcome to our Open house on Wednesday Sept 23rd, 2015 at 7:00pm. Try Curling, meet your fellow club members and welcome new ones. We are proud of the work that has happened over the summer season and we want to show it off! Updates from the lounge to the lobby. A feature game will be played, the lounge and games room will be open and our New MCC Cafe will have featured items. See you there! 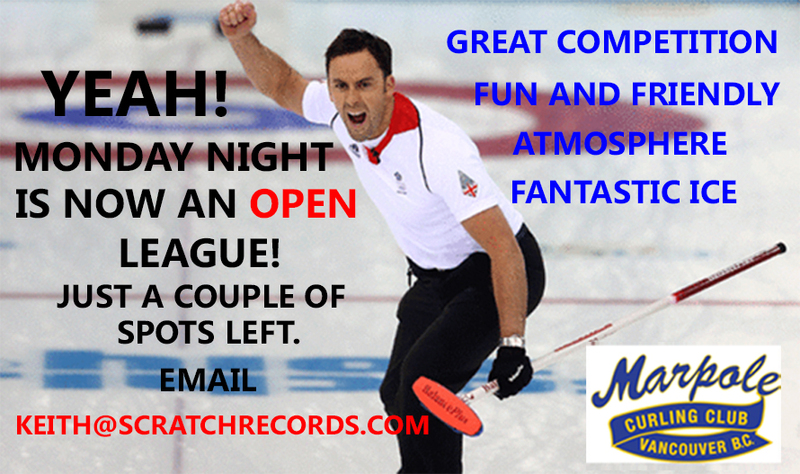 Due to popular demand we are now proud to present the new Monday Night Open League. It’s filling up fast with just a few spots left. The League is shaping up to have a bit of competition as well as maintaining our Marpole tradition of fun and friendly curling. Email Keith at keith@scratchrecords.com to register your team. 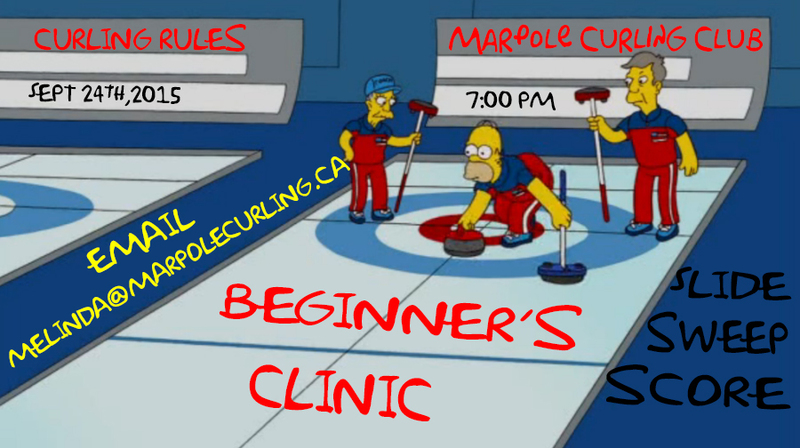 The time has come to register for the Marpole Curling Club’s Annual One Day Opening Fun Spiel on Sunday Sept 27th, 2015. It’s an open format for teams and all skill levels are welcomed! It’s a FUN SPIEL! 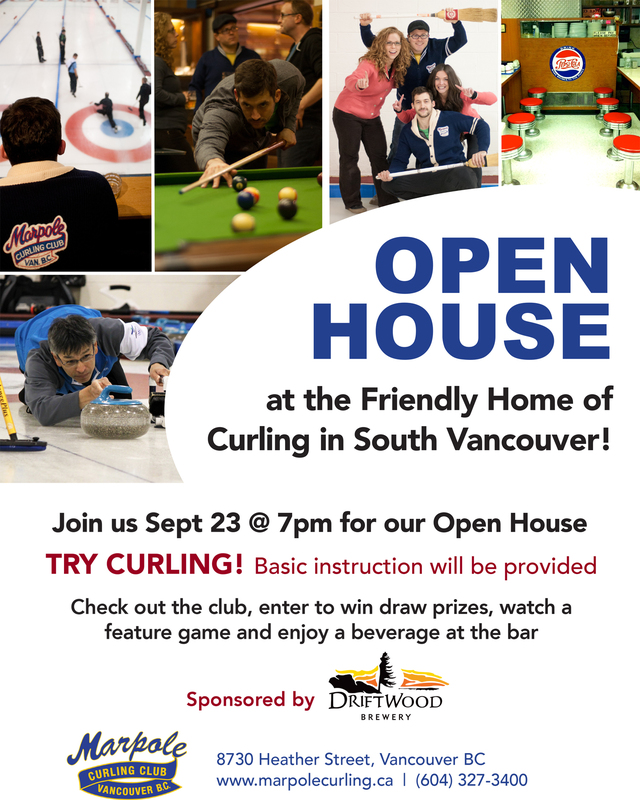 It’s a great way to get geared up for the upcoming Marpole season or to check out our club and experience our fantastic ICE! We hope to see you here! 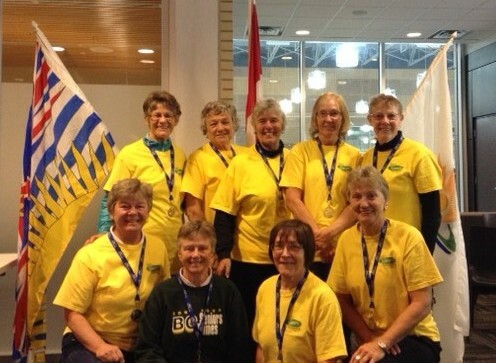 Two women’s teams from Marpole competed in the 55+BCGames hosted by North Vancouver August 25th to 29th, 2015. The Joanne Mick team (Charlotte Edwards, Pat Upper, Judy Santowski) won the silver medal in the 55+ Women’s event. The Laura Rampton team (Lu Petterson, Janice Robinson, Marian Dickens, Joan Barker) won the gold medal in the 65+ Women’s event. Curling was held at the Vancouver Curling Club. 3300 athletes competed in the 55+games in a multitude of sports and recreational activities. It was fun to be part of these games and meet seniors from around our province who are staying active and competing. The mission of the games is to improve the health, lifestyle and image of British Columbia’s 55+ population. Many thanks to Joanne Mick who is the co-ordinator of curling for our area (Zone 4). Joanne would like to see Marpole teams enter the mixed and men’s events as well. The 2016 games will be held in Coquitlam September 20-24.